Since needlepoint requires the entire ground fabric to be covered in some fashion, the Nobuko Stitch is a technique that covers the canvas quickly--and, it is easy to learn as well. The textured filling of the stitch is worked in rows of alternating long-and-short diagonal stitches (similar to the Continental Tent Needlepoint Stitch), which makes it quite versatile and beautiful. The Nobuko Stitch can be worked in a single colored thread or with different colors for each stitch or row. It is absolutely stunning when worked with overdyed or variegated threads. Like many needlepoint stitches, with just a tiny variation in the way it is worked, you can create any number of new stitch combinations. One of the most exciting variations is the Double Alternating Nobuko Stitch. In this Needlepoint Wiki, you’ll learn how to work both the basic Nobuko Stitch as well as the Double Alternating Nobuko Stitch. Once you learn the basics, you’ll be encouraged to come up with a variation of your very own. No mystery is involved when working the Basic Nobuko Stitch. If you are comfortable with using tent needlepoint stitches, you will easily get the hang of the Nobuko stitch. How? Well, the easiest way to describe it is that all the stitches are diagonal ones, except they are not evenly sized. The first stitch is made like a single diagonal stitch and the second one is worked as a longer diagonal stitch. All you have to do is remember to alternate the two stitches as you work across the canvas, and in less than 10 minutes you will have mastered the super easy Basic Nobuko Stitch. Using the image above, begin working from right to left by bringing your needle up through the canvas at position (1) and over one intersection to position (2) for the first part of the Nobuko Stitch. Count 2 canvas mesh intersections to the right of the now completed first stitch, and then one intersection down to come up at position (3). Go diagonally over 3 canvas mesh and down into position (4) to complete the second part of the Nobuko stitch. Continue working across the canvas from right to left, alternating steps 1 and 2 until you have completed the entire row. 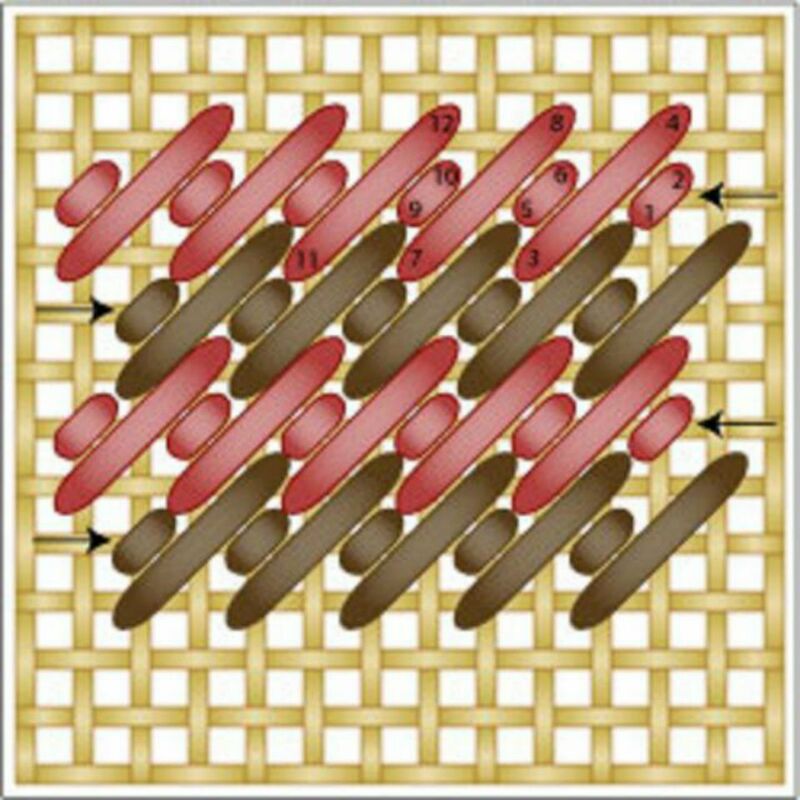 To begin a second row, work from left to right as indicated by the brown colored stitches in the above image. Each short stitch should share the same hole as the long diagonal stitch in the row above it, and each long stitch should do the same with short one in the row above or below it. Work across the row repeating steps 1 and 2 ending at the right side of the needlepoint design area. You are now ready to start a new row going in the opposite direction. The Double Alternating Nobuko Stitch is worked just like the Basic Nobuko Stitch, except it has alternating groups of two long and two short diagonal stitches. Although it may appear a bit daunting, once the pattern is established, it flows fast and smooth across the needlepoint canvas. Nobuko needlepoint stitches are decorative and highly textured, which make them perfect for adding accents to needlepoint designs that have large areas of grass, sky and water. Many needlepointers love to use the Double Alternating Nobuko Stitch for stitching clothing, wicker baskets, houses and buildings. Working this stitch technique requires a bit of intense concentration. You will definitely need to look continually at the above stitch diagram for the first few rows. After this, a pattern will be established that will make it easy to complete the stitch without having to look frequently at the diagram. To get started, print a copy of the diagram and enlarge it as needed to easily follow the stitch sequence. It is recommended that you use a fine-tip highlighter to trace the working direction before starting to stitch. This way, you'll get comfortable with making the Double Alternating Nobuko Stitch before you actually use needlepoint thread. Use the following steps to complete the stitch. Starting on the right side of the canvas, come up at position (1) and cross diagonally over 3 canvas thread intersections to go down at position (2). Make another stitch the same way and the same length (positions 3 and 4). Come up at position (5) and work diagonally over a single canvas mesh intersection to position (6). Make an additional stitch the same way (positions 7 and 8). Repeat these two alternating stitch sequences across the canvas from right to left until the entire row has been finished. Work the second row by beginning on the left side of the diagram as indicated by an arrow. Come up at position (1) and down at position (2), watching the placement of the stitches very closely. Continue working across the entire row. Change sides and begin a new row as in steps 1 and 2, working in the opposite direction from the previous row. The Double Alternating Nobuko Stitch is always worked in horizontal rows with diagonal stitches.